What’s the Difference between Mosquitoes and Ballistic Missiles? Well a lot, really, but not as much you might think. When it comes to knocking them out of the sky, they’re practically the same thing. You might not be able to splat an ICBM with your hand, but both go down pretty fast when you hit them with the right laser. Over the last week, two distinct weapon systems were debuted by their respective manufacturers. One shoots ballistic missiles out of the sky, the other fries mosquitoes in flight, and both do it with lasers. While the scale of the targets is noticeably different, the design and methodology of the kill systems is amazingly similar. The Pentagon announced last Thursday that the Missile Defense Agency successfully tested an air-based laser-powered missile defense system called the ALTB (airborne laser testbed). After firing a short-range ballistic missile from a sea-based platform, a tricked-out Boeing 747 in the air nearby detected the launch and began tracking the missile with a low powered laser. 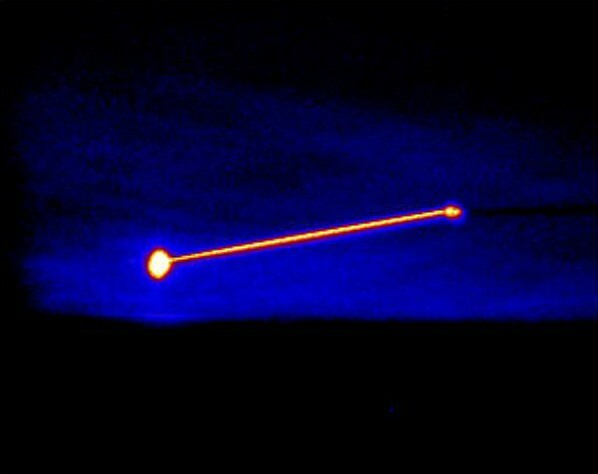 Shortly thereafter, a second laser of similar strength fired at the target to measure and compensate for changes in atmospheric conditions. Once that pair of targeting lasers had a satisfactory lock on the missile, a third mega-watt class laser came online. A short burst from this crazy death ray caused the rocket to heat to the point of structural failure and explosion. Launch to detonation took just two minutes, and the missile was destroyed before completing its boost phase. That’s a first for any system. What makes laser weaponry so appealing to the missile defense folks is its speed-of-light projectile velocity. After the system confirms a launch and the projectile is targeted, there isn’t the flight delay of a conventional missile-based countermeasure. The laser system is also relatively cheap compared to its predecessors on a cost-per-intercept basis. The one thing holding this technology back is its limited range. The current ALTB system requires an unimpaired line of sight between the laser and missile, which even when fired from a 747 is limited to several hundred miles. Knowing that this high-tech bug zapper would be used in underdeveloped locations like sub-Saharan Africa, the designers built it to be (relatively) cheap and reliable. It uses the least amount of energy necessary to fry its target, reducing overall power consumption and minimizing the potential for collateral damage. It’s constructed from somewhat common materials, like parts of projectors, digital cameras, and laser printers. Intellectual Ventures won’t manufacture this mosquito defense system itself, but is opening the technology up for acquisition to interested parties. With laser weaponry functionally applied to the widely disparate scales of both ballistic missiles and mosquitoes, it’s clear that the industry is moving forward at a rapid pace. It may not be long before we see laser weapons incorporated into close support vehicles like Black Hawks and LAVs. Personally, I look forward to watching my photonic fence frying mosquitoes in the backyard at a genocidal clip. After a few beers, I bet the light show is great entertainment. ~ by Wil Finley on February 14, 2010.